Following last night’s 50 second shaker here in New Zealand (magnitude 7, but luckily nice and deep), I figured this image was appropriate. 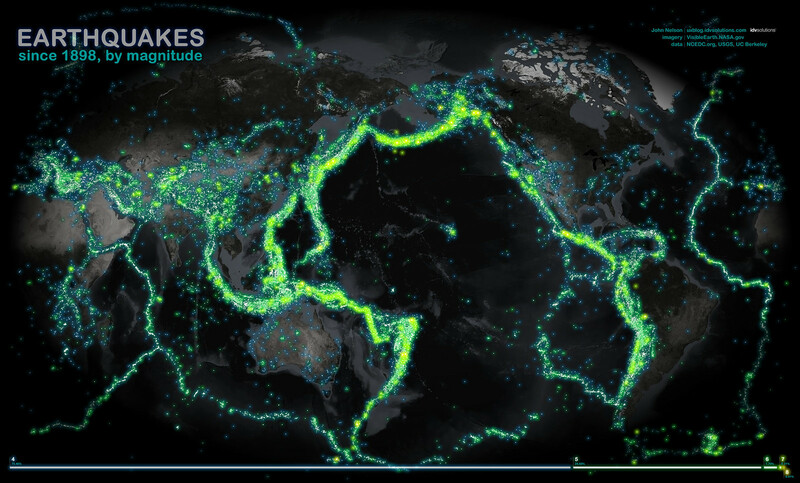 Earthquakes since 1898, by magnitude. Credit: IDVSolutions. With a heaping pile of data from NCEDC.org and the USGS, every recorded earthquake with a magnitude of 4 or higher was spattered onto this map. The satellite imagery was sourced from an August composite via NASA’s Visible Earth. More details on last night’s big earthquake (there were small ones, too) at geonet.org.nz. Also, check out the #eqnz twitter stream, which has been going since the Darfield earthquake (at least). Is that Earthquakes since 1898 or 1989? Sorry, 1898! Thankfully it was only the caption that was wrong, and I’ve corrected it. Thanks for the heads up!